She said that you’re fooling yourself if in your head you think something else than how you're feeling. I have to admit that she has a good point there. Because if you're really convinced that you’re not good enough for something, you can repeat endlessly that you are good enough (which of course you are! ), but if you don’t FEEL this, you will probably never believe it. And no, in this case it doesn’t work. But is this really positive thinking? Or is this saying a positive sentence? I would say the latter. And that is why it won’t have any positive effect on your life. Just notice the kind of thought or belief you have. 2. Ask yourself if you can be really sure that it’s true what you’re thinking. “I am good enough”. Or maybe it’s easier for you to say “It’s possible that I am good enough”. It’s important that it’s something you can FEEL. Because when you feel it, it will have a positive effect on your life. And on how you feel. Because whatever you give your attention to grows, also good feelings. And the more you feed those good feelings, the more of them you will get. You can for example write it on a sticky note and hang it somewhere you can often see it. It’s fun to see this reminder of something that makes you feel good. Or that gives you a smile on your face. You should try it! By replacing the old thought by a new one and repeating it for yourself, it will also replace your old conviction by a new one. And this way it will make a huge difference in your life! Firstly because with positive thoughts you simply will feel better. Secondly because the law of attraction will bring more positive things in your life where you can have positive thoughts about. What are you going to focus on? What is your new, happy thought? Please let me know, I'd love to hear from you! If you'd like some help with positive thinking, my free package AIR - An Invitation to Relax is perfect for you! Find the imperfect moments in your day to find your calm in the daily chaos. 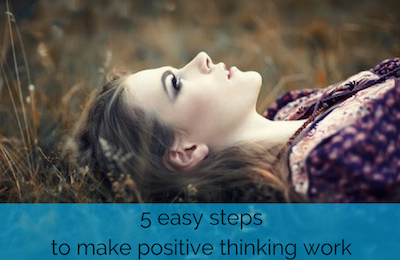 When feeling less overwhelmed you'll find that positive thinking goes much easier! I'm sure you'll love it! Click here to receive this free package today!